The launch of Belo Horizonte’s MOVE bus rapid transit (BRT) system seeks provides the city safe, high quality mass transport in an effort to slow the advance of the private car. Photo by Luisa Zottis/EMBARQ Brazil. 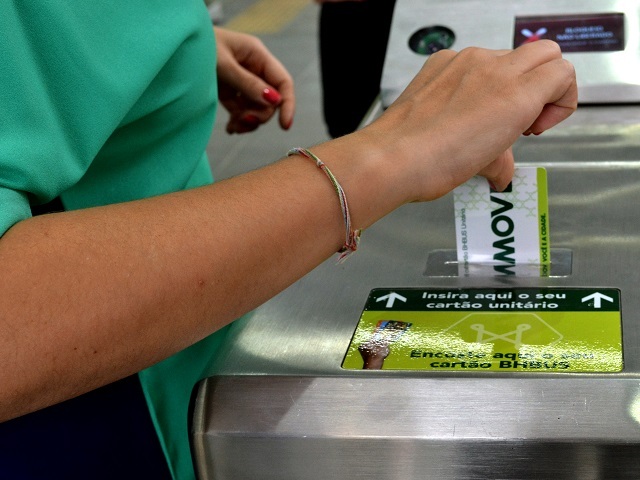 Belo Horizonte, one of the host cities for Brazil’s 2014 World Cup, is using its newfound spotlight to showcase its growing transport system. The city launched its MOVE bus rapid transit (BRT) system this past Saturday, March 8, 2014, which will have a transformative effect on the mobility patterns of the city. The path to this new system has not been easy. The city was designed in 1897 to hold the 100,000 inhabitants expected in 100 years. Today the city is home to 2.5 million people, and this population boom has caused an in immense strain on the city’s infrastructure. “This unplanned urban growth created a lot of externalities, including high levels of traffic congestion and air pollution”, explains Brenda Medeiros, EMBARQ Brazil’s Transportation Projects Manager, who has worked with the city of Belo Horizonte for over two years to help launch a safe, reliable, and efficient MOVE system. Aiming to improve this scenario, city leaders have taken action, and the city now boasts comprehensive urban mobility plan, the PlanMob BH. EMBARQ Brazil is one of the key partners in the improvement of Belo Horizonte’s transport system. Since the signing of a Memorandum of Understanding (MoU) between the city and EMBARQ Brazil in 2010, a series of projects have been developed to ensure that Belo Horizonte’s BRT system serves the needs of urban residents. EMBARQ Brazil’s work, in partnership with the city, includes road safety audits and trainings, user satisfaction surveys, marketing workshops, and strategic alignment discussions designed to advance the implementation of a quality BRT system. The MOVE system will eventually be composed of three BRT corridors – Antônio Carlos, Cristiano Machado, and Hipercentro – which will connect the city’s center to its major districts. This past week saw the beginning of operations on the Cristiano Machado line, while the full system is expected to launch in May 2014. The system will have a total of 23 kilometers (14.3 miles) of dedicated bus lanes that will serve approximately 700,000 people each day in Belo Horizonte. According to Brazilian vehicle insurance provider DPVAT, 54,000 deaths and 444,000 cases of permanent disability due to traffic crashes were registered in Brazil in 2013, landing it in the top five countries with the most traffic fatalities. It’s no surprise then, that traffic safety is a major focus for Brazilian cities expanding their transport networks. In an effort to reduce bus crashes, EMBARQ Brazil, EMBARQ Mexico, and SIBRT conducted a survey of bus companies in Belo Horizonte on best practices for road safety. Their “Safety First” project aims to raise awareness about road safety and improve internal management and driver training to reduce the number of crashes involving buses in Latin American countries. To this end, representatives from 73 bus companies completed the safety module of the Multipliers Capacity Training program, which teaches safe driving practices for bus drivers to provide safe, quality service to BRT passengers. The 115 drivers that attended the training will in turn teach their colleagues these practices, which will instill safe driving practices throughout the entire network of 3,000+ bus drivers. Learn more about the preparations that went into launching the MOVE system at embarq.org, or in Portuguese at embarqbrasil.org. EMBARQ Brazil’s traffic safety work in Belo Horizonte is made possible by Bloomberg Philanthropies and the “Safety First” program is sponsored by FedEx.